In this post we will provide an agent based model that solves BFS in a generic way (as generic as it can be done with a standard NetLogo programming style). For that, we will start working with a very basic problem that can be solved as a search in a adequate way and then we will move to solve some other, bigger and more interesting, problems by using the same general solution. You can find a more theoretical point of view of search problems in this post or in this one. BFS is one of the search algorithms that belongs to the group of blind search algorithms that, essentialy, all can do is distinguish a non-goal state from a goal state. Suppose that you want to start from a first number and reach a second one by using only some allowed operations, specifically multiplying by \(3\), adding \(7\), or subtracting \(2\). We would like to know the shortest (or one of the shortest if there are several ones) sequence of operations for this goal. Defining the state space: in this case is very obvious, our states will be the different numbers that, eventually, we can reach by using the allowed operations. You don't need to be strict with this, only to know what kind of information you will need to represent your problem and being sure that your state space is closed under the transitions (operations), that is, if you take a state in your space and apply any of the valid transitions, you obtain a (probably new) state in your space. Defining the valid transitions: in this case is easy too, our valid transitions are the three permitted operations of the problem (and they will be represented as: \(*3\), \(+7\), \(-2\)). In our problem the transitions are the same independently of the state where they will be applied to, but sometimes there is a general set of valid transitions and their applicability will depend on the specific state to be applied to. Although in this basic problem the states and transitions (together, they form the representation of the problem) can be directly obtained from the text of the problem, one can find cases where neither states nor transitions are so clear. In these problems some precautions have to be in mind: states must store all the information that is important for the problem, and transitions have to be realistic in the problem and they must allow to reach the goal from the starting point. Also, it is usual that several representations can be valid for one single problem, choosing correctly between them can be fundamental for the simplicity of the solution and the effectiveness of the search algorithm to be applied. Start from the initial condition/state of the problem. Apply all the valid transitions to this state and obtain its children states. Verify if any of the children states satisfies the properties we look for the solution of the problem (have we reached the goal?). If it is the case, stop the search and return the sequence of transitions we have applied from the start state to the goal. Otherwise, take every children state and repeat the procedure. Of course, some considerations must be done. For example, every time we obtain a new state, we check if the same state had been obtained in a previous application. If so, we will not add it again, because the first time we obtain it ensures a shorter sequence from the start to the goal (if any goes through it). With this simple trick we can avoid to search several times over the same state, reducing the computation time (trading it for memory to store the states we have reached previously). Let's go for the NetLogo solution. Although it is possible to use common data structures for this (as lists), we will make use of agents (turtles) to represent states in our space, and links to represent transitions among them, taking advantage from the extended capabilities these objects provide. Now, we will define the procedures that allow to apply transitions on states and obtaining the successors (children) of a specific state. These reports have to be customized in order to solve different problems using the same BFS function. To facilitate the understanding of the general method that will be given bellow, keep in mind the concrete problem we are trying to solve. Rules are represented by using pairs [ "representation" f ] in such a way that f allows to transform states (it is the transition function) and "representation" is a string to identify the rule. Since in this problem the valid transitions are very short and easy, we will use tasks in order to store the transition functions. Although it is not necessary, we can add some extra reports to restrict, for example, the valid states and/or the valid transitions. Here, valid? is a boolean report to say when a states will be valid, for example if the content is positive. The previous reports are auxiliary procedures. Next, we define a mandatory report that will be used by the general BFS search procedure: children-states is an agent report that returns the children (successors by transition applications) for the current state, it will return a list of pairs [ns tran], where ns is the content of the children-state, and tran is the applicable transition to get it. To get it easily in NetLogo, you only have to map the applicable transitions on the current content, and then to filter the valid states. One more mandatory report is needed, final-state?, an agent report that identifies the final states for the problem. It usually will depend on a property of the content of the state (for example, if it is equal to an specific final state), and in general it allows the use of parameters because maybe the verification of reaching the goal depends on some extra information from the problem (for example, the final state to compare with). Note that, if you want to apply this algorithm to a different problem, all you need is to adapt the previous procedures to fit the representation of your problem. It is supposed that you will not need to change anything else unless you want some extra features that goes beyond the scope of this general solution. Anyway, it must be easy to make the modifications in (almost) all the cases. children-states : reports the children states of the current state. final-state? : reports if the current state is a final one. The general BFS procedure to achieve this task is given, and commented in the following lines. It receives two parameters, the initial state to start with, and the final state for the most common case where the goal is reached when some specific state is generated. If the goal of your problem must be verified with some other property you can extend the final-state? report in order to satisfy your necessities. ;   reduce with an appropriate function). ;   so we choose only one of them. That's all. The three basic procedures to solve the search problem via BFS have been shown. In the next lines you will find auxiliary procedures that act as utility functions for the previous and the interface. Highlight report is used as a the parameter function for reduce. Given two connected states (that are connected directly through a link/transition) it will highlight the link and returns the second state. As a secondary effect, it will print the textual sequence of transitions to be applied. In case you only want to show the path of links connecting the starting state to the goal, you can use the clean procedure, that erases all the states out of the solution path (in red). Use it after highlight. To provide a clear representation of the state space, we use a radial layout for the tree of generated states. And finally, we have a procedure to print some information about the search problem to be solved. By using the model that you can find here you can test how the algorithm works and how the different procedures and reports play their roles in it. You can find also a model that runs the same algorithm but in an ordered way (in the order the agents are created) and can be time-stepped to see the creation process by children or by complete levels. How can we solve more problems with this pattern? pour the content of one jug in the other. The first step is not about programming, but about giving an abstract representation of the problem. In this case, we will use pairs as states, \([j_1 j_2]\), where \(j_1\) is the water in the first jug, and \(j_2\) is the water in the second jug. 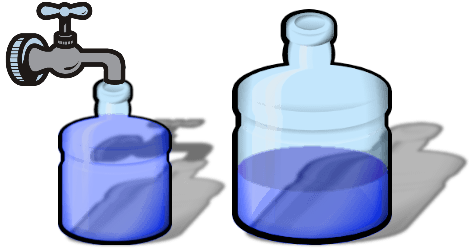 Hence, one initial state could be \([0 0]\) (both jugs are empty) and any final state is of the form \([x 2]\) (the second jug has \(2\) litres). valid? is a boolean report telling which states are valid. Thanks to the definition of the transitions and states, children-states report doesn't need any modification (in some cases you may want to change it, but it is not the case now). Finally, the final-state? report identifies the final states for the problem with the property they must verify. In this case, the water in the second jug must be 2 litres. That's all, here (URL) you can find the model with this modifications and test the different paths you obtain modifying the conditions of the problem. Remember that now the Final_State input box is not necessary, because we defined final-state? in a different way, but our BFS procedure is still using it as input parameter. As a last example, we will solve the Towers of Hanoi problem, where by moving one disc at a time between towers (and with the restriction of allowing only to put a smaller disc over a bigger one) we must move all the discs from one tower to a different one. The most common version of this problem contains \(3\) towers and \(3\) discs initially in the first one, and the goal is to get the three discs (in the same order) in the last tower. A general case will have \(N\) discs and \(M\) towers. The representation of the states that we will use is based in lists of numbers. The different discs will be represented by numbers from \(1 < 2 < 3 < ... < N\), and the content of a tower will be given by the list of discs it contains \([d_1 ... d_k]\), where \(d_1 < d_2 < ... < d_k\) (disc \(1\) is over disc \(2\), that is over disc \(3\),...). Finally, a specific state of the problem will be the list of the \(M\) towers we have, \([ [T_1] [T_2] [T_3] ... [T_M] ]\). For example, the usual initial state is [ [1 2 3] [ ] [ ] ], the final state is [ [ ] [ ] [1 2 3] ], and one intermediate possible state could be [ [2 3]  [ ] ]. Note that this is the general form of all the possible transitions, but not all of them are applicable on any state, it depends on the specific content of the state (for example, in the initial state the transition [2 1] is not applicable because there are no dics on the tower \(2\) that can be moved to tower \(1\)). For this reason, this agent report returns the applicable transitions for the content (it depends on the current state). We build a report, apply-transition, that returns the result of applying a transition t to a state s. It is used directly by the map application of mandatory children-states report. output-print " Move the top discs"
Note that the initial state will determine the number of discs and towers of the game, and it is not restricted in any way. Here you can get the model and test the results it provides. From a computational point of view, BFS algorithm is complete (if there is a solution, that is, a path from the starting state to a goal, it will eventually find it), but as the solution is far away from the initial state, the resources to get it (in time steps and memory space) grows exponentially. It is easy to modify the BFS procedure to obtain a DFS one. 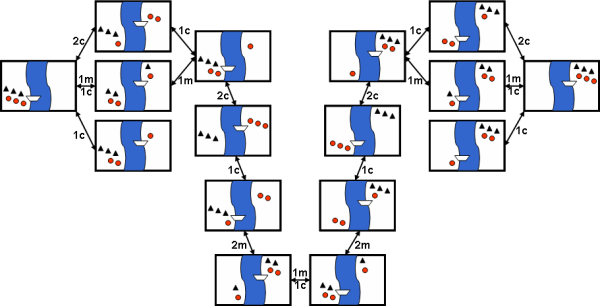 A Depth-First Search is technically similar to the BFS, but in every step we don't create all the children states of a given one, but only the first (in some order) child and, if it is not the goal, we compute its children before to compute its "brothers". In this way, the tree is generated going deeper instead of filling a complete level. If you are lucky, you will find the goal in a more faster way, but the possibilities to get lost in the deep world of the search tree are higher. Consequently, DFS is not complete (maybe there is a short solution using the next unexplored child, but it gets lost forever in a bad useless branch), but sometimes it could use much lower resources. In a later post we will present some efficient algorithms to deal with the same kind of problems, trying to avoid the exponential grow by using some extra information from the problem ans the data structures it uses. But note that, once the methodology of BFS is presented and functional, "all" you need to solve a search problem is to find a convenient representation of your problem in a State Space (don't forget the transitions).